Loss of balance between the scalp's moisture and oil can lead to a variety of problems such as dandruff, itching and stickiness. 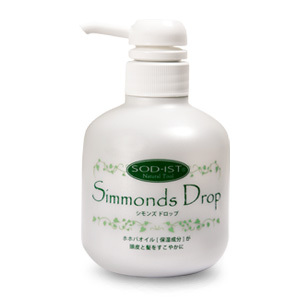 Simmonds Drop Hair Shampoo was developed to keep the scalp and hair healthy. Containing over thirty high-quality natural plant-derived ingredients including the moisturizing ingredient jojoba oil, this shampoo gently cleanses your hair while washing away excess oil and conditioning your scalp. * This product contains no tar-based colorings or synthetic perfumes.